The Endowed Chair, established by in loving memory of the donor's son, will be held by a distinguished member of the humanities faculty and will support research and teaching about the Sikh community from a multicultural and global perspective, including, but not limited to foci ongender, diaspora, and literary, historical, and cultural studies. The chair was envisioned in 2007 by Hardit and Harbhajan K. Singh, through the Sikh Foundation, to fund an endowed chair in Sikh and Punjabi studies in the History Department. 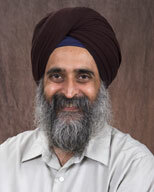 "The Sikhs have been in California for more than 100 years, and the Sarbjit Singh Aurora Endowed Chair in Sikh and Punjabi Studies provides an opportunity for students to learn more about Sikh religion, history, arts, culture and diaspora," said Dr. Narinder S. Kapany, chairman and founder of the Sikh Foundation. "The chair is an excellent basis for comprehensive study and research in Sikh studies at UC Santa Cruz." In December 2010, Professor of Economics Nirivikar Singh was appointed to be the first chair-holder of this endowment. You can read about his appointment here.